Lucky number four.Long awaited, incessantly discussed and sold out even faster - Google's latest Nexus device raises the battle cry against other high-performance smartphones with an unrivaled price of 349 Euros (~$450) for the 16 GB version and 299 Euros (~$390) for the 8 GB version. Google hasn’t released any devices with its stamp of approval after it acquired Motorola. Google has followed Microsoft in promoting its Android platform as an independent OS. 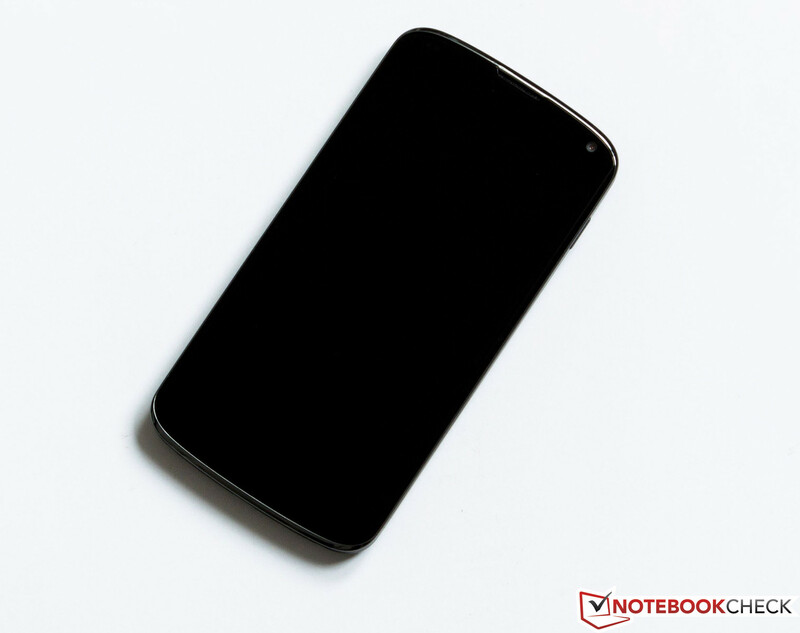 It has tried to remain impartial by having its Nexus devices developed by different companies that have licensed its product, and LG having the honors for this version of the device. To the dismay of many customers, the first Nexus 4 devices were sold out within no time in Google's Play Store. The second wave that was available from December 6th was again out of stock just before Christmas. Seen objectively, this is no surprise. The combination of the low price and state-of-the-art hardware is not the only selling point. Its innards are comprised of a quad-core Krait clocked at 1500 MHz and 2 GB of RAM alongside the Adreno 320 GPU. The buyer can select between a storage capacity of 8 or 16 GB. There are no color options; it is only available in black. Google's new super weapon was a hot topic and was eagerly awaited even before it was launched. Read in our review whether it can meet the high expectations and how we rate it against the competition. 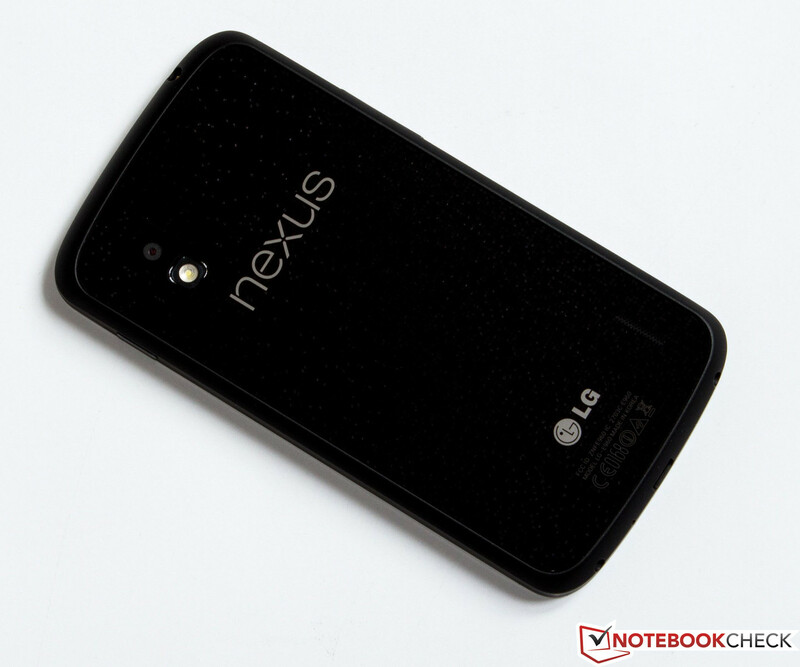 The design of Google's Nexus 4 has not undergone any significant changes compared with the Samsung Galaxy Nexus. It is still a plain black block at first glance. However, it becomes apparent that various materials have been used and that it is in no way an ill-considered design when looking closer at the device. Just like the iPhone 4 range, the non-removable back cover is glass. The entire surface of the device is covered by glass. The border is made of a polycarbonate material. The lower part is matte black and encloses both hardware buttons and naturally the ports. The upper part features a dark silver color and serves as the display bezel. The display's left and right outer edge exhibits a slight downward curve. 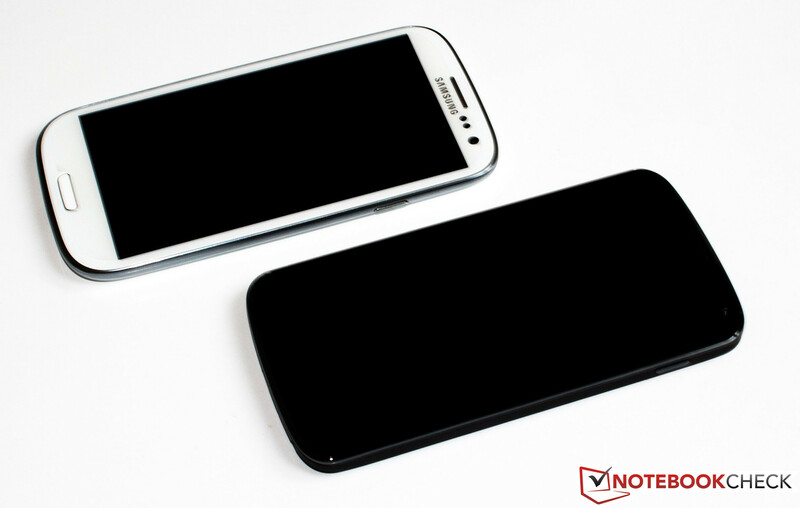 Samsung's Galaxy S3 features a similar curve but in the exact opposite direction. The display bezel does not protrude and consequently does not provide the screen with additional protection against scratches. Probably everyone knows this problem: You just polished the touchscreen and five minutes later you would again like to reach for the microfiber cloth. Cleaning the Nexus 4 is twice the effort because the back is just as susceptible to fingerprints as the front. The different materials of construction give an impression of high quality. The smartphone can be twisted marginally with moderate force but is largely pressure resistant. Our test model exhibited one point of particularity. A rattling noise was heard from the inside when we shook it. 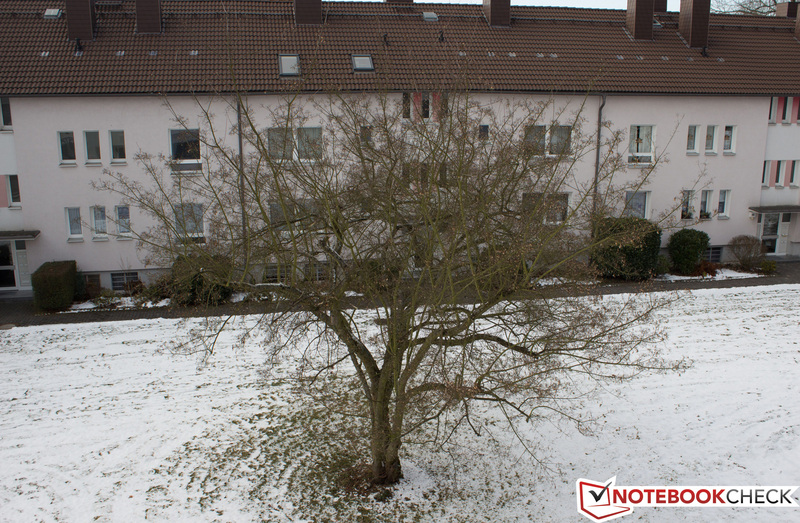 The noise is produced by the camera's image stabilizer and is absolutely normal. 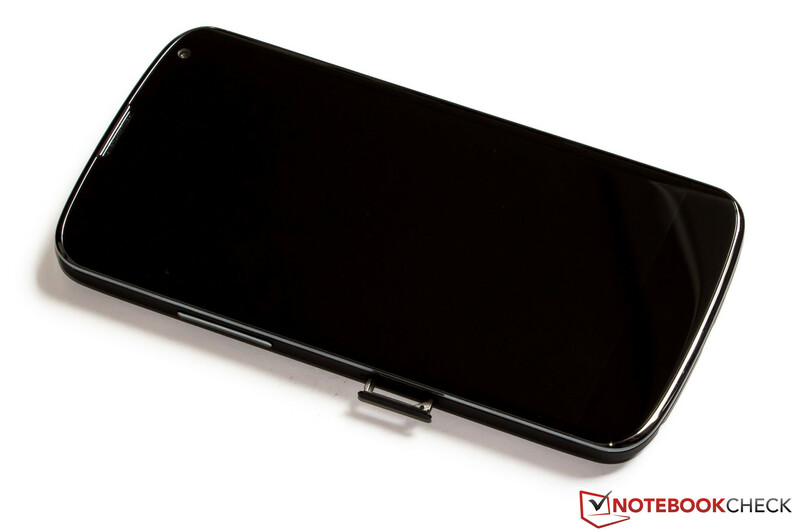 The case is only available in black and its size has only been modified insignificantly. 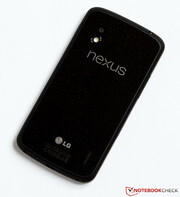 With a length of 133.9 mm, it is marginally shorter than the Galaxy Nexus (135.5 mm). However, it is thicker, wider and heavier. The Nexus 4 has a width of 68.7 mm (difference: + 1.9 mm), a thickness of 9.1 mm (difference: + 0.2 mm) and weighs 4 grams more than its precursor. 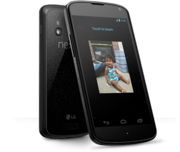 The Nexus range follows the current smartphone trend of increasing display size. The manufacturer LG manages to install a 0.05 inch larger screen due to the slightly larger dimensions. 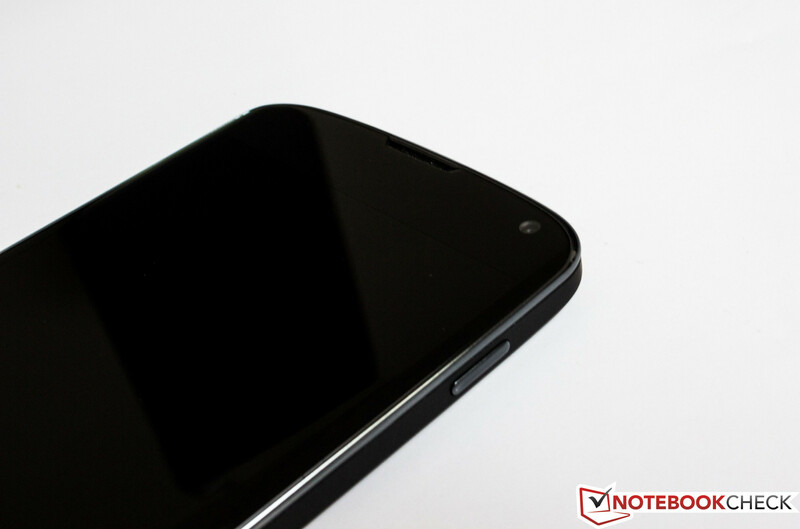 The Nexus 4 closely follows the interface positioning of Samsung's Galaxy S3. The phone exactly copies the port arrangement of the Galaxy S3 with regards to the power button, headphone jack and the volume rocker. Nothing stands in the way of multimedia entertainment on a big screen with the right cable. More information about that can be found here. Beside its use as a multimedia interface, the micro-USB port has two other important functions. It can be used as a removable drive when linked to a computer or for recharging the battery via the modular charger. Like in all iPhones, the 2100 mAh battery is not removable and can only be serviced by a licensed technician. As mentioned in our review of the Nexus 10, Google doesn't want to ‘complicate the user experience’ for the user and thus omits a microSD for memory expansion. 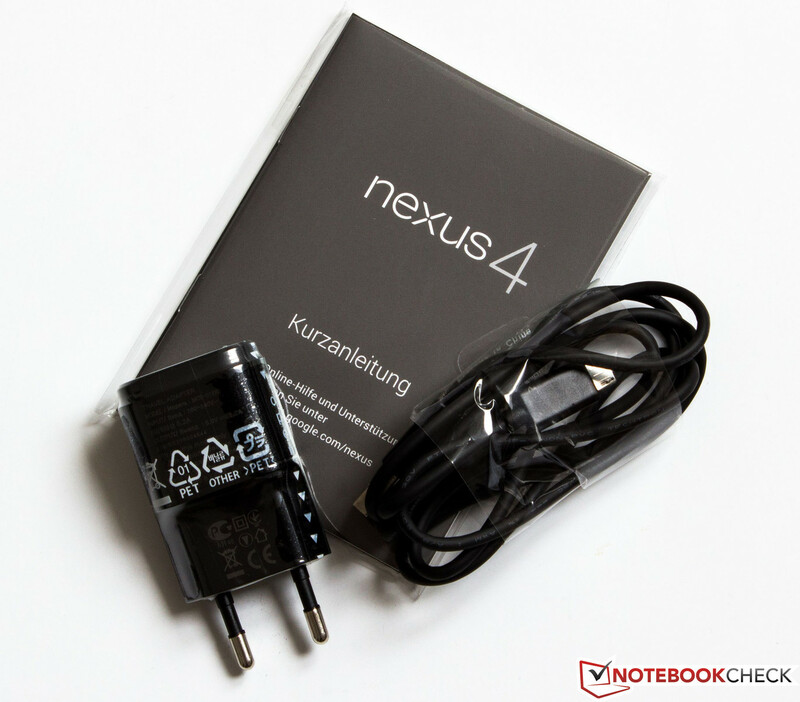 Since this is also true for the Nexus 4, the potential buyer should carefully consider how much capacity is needed before ordering the device. Our test device features flash memory of 16 GB (net: 12.92 GB useable). 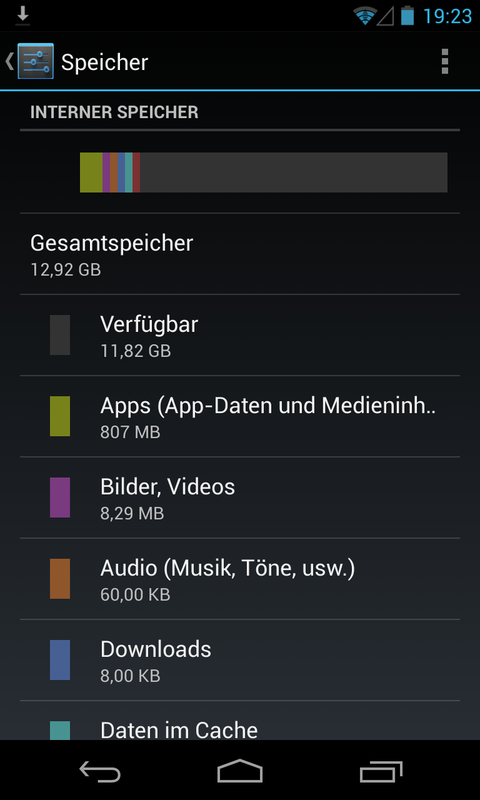 There is also a model with 8 GB of memory capacity available in the Play store. There is no need to worry about updates. It is not an insignificant advantage when both hardware and software come from the same developer. But as the device becomes older, its ability to run newer iterations of vanilla Android becomes lower and lower until any further update would render the device unusable. 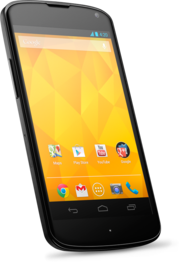 Google's latest flagship is powered by the Android operating system Jelly Bean 4.2.1. Superfluous bloatware will not annoy the user and s/he can take delight in a very powerful and slim operating system. Shortly after the release of version 4.2, there was a minor update to squash a few bugs in the operating system. The latest 4.2 version includes a few new features. One of these is dubbed "Photo Sphere" and enables taking 360° panorama shots. This feature is very intuitive and using it works right away with a remarkable results. The navigation bar has always been an integral part of Android and is indispensable for the system. To increase utility even more, a subtle and nondescript facelift was given to the user interface. 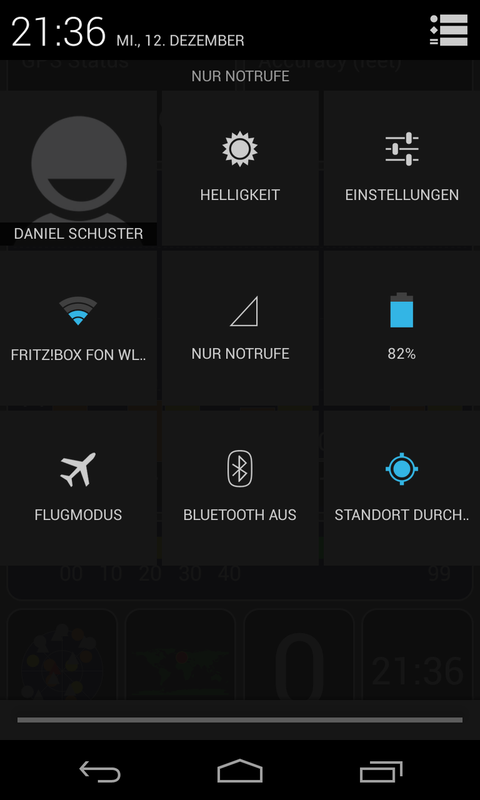 Now, it is possible to exhibit further widgets in the right upper area when the message bar is opened. "Daydream" can be used when the device is connected to the charger or in a docking station. This feature is easiest explained with the word "screensaver". The current time, a slide show or other contents glide over the dimmed screen when the corresponding setting is selected beforehand. 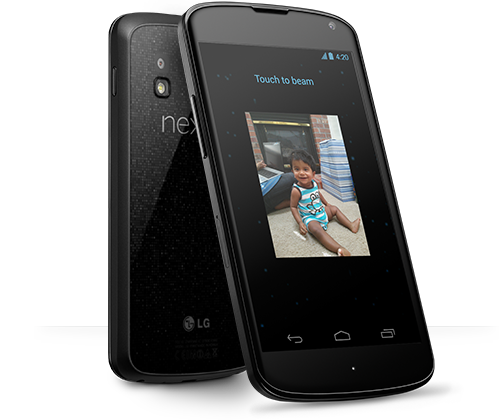 The Nexus 4 features a vast array of communication modules. The high-end device even sports an LTE chip although neither LG nor Google specifies it. This chip is disabled and cannot be used (in Germany). An HSPA+ 42 module is installed in order to ensure sufficient speeds for internet browsing. This makes a theoretical downstream speed of 42.2 megabits per second in the UMTS network possible. Naturally, features like NFC (near-field communication), Bluetooth 3.0 and GPS are a must. According to the specifications sheet, the main Wi-Fi module supports 802.11 b/g/n standards. However, a reader pointed out the 5 GHz capability according to standard 802.11 a. We often noticed that the Wi-Fi module had problems reconnecting to a previously identified access point during the test period. This can only be remedied by manually deactivating and reactivating the Wi-Fi module. We did not experience any problems with other access points during our tests. The installed GPS module connects within a few seconds indoors when standing next to a window. The accuracy increases outdoors and in "line of sight". We did not ascertain any unexpected connection interruptions in our test scenario. On behalf of Google, LG installs two camera modules in the Nexus 4. The primary camera alongside a flash is on the back and features a resolution of 8 megapixels. The front-facing camera can be used as a webcam for video calls via Skype. 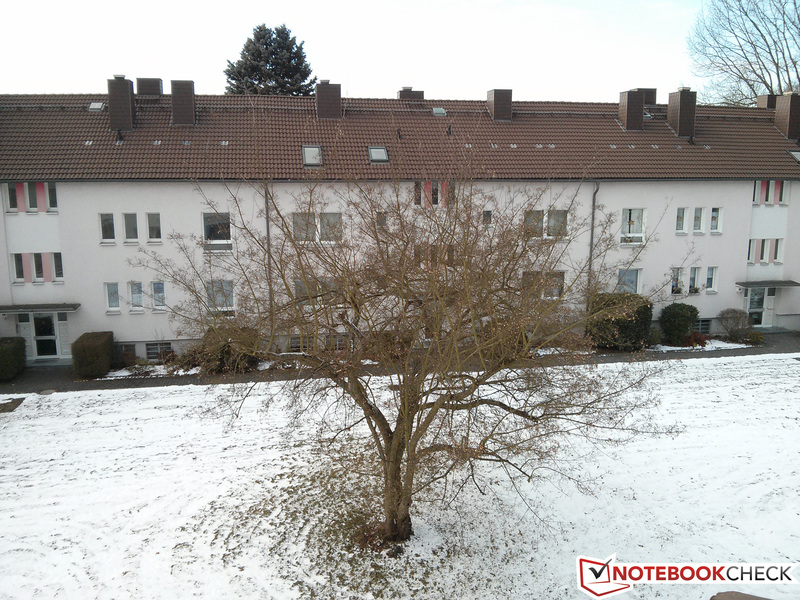 It features a fairly low resolution of 1.3 megapixels. Both cameras can record videos in Full HD quality. The front-facing camera achieves a resolution of 720p (1280 x 720 pixels) and the primary camera records in 1080p (1920 x1080 pixels). 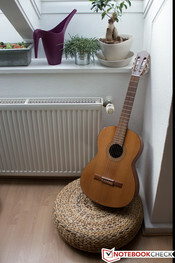 The primary camera's small sensor responds with slightly blurred details in moderate indoor light. Many cameras have great difficulties reproducing badly illuminated objects. This is often reflected in heavy image noise. The 8 megapixel sensor delivers a decent picture although the entire representation is much darker than that of the reference camera. 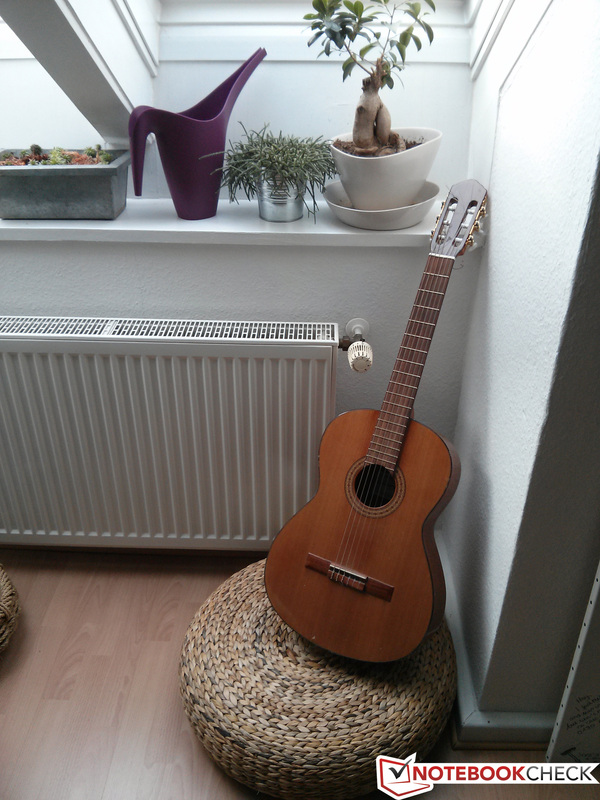 Like most front-facing cameras, the picture quality is unfocused to take snapshots. The primary camera shoots good outdoor pictures. The focus is decent and the brightness deviation decreases when compared with the reference camera. Almost every smartphone now features an 8 megapixel camera sensor. To stand out from the masses, Google installs a nifty feature in its latest Android version. "Photo Sphere" enables taking pictures in a 360° panorama shot by lining up several frames. The result surprised and awed us at the same time. Great pictures were possible right away and it was easy in contrast to taking such a panorama shoot with a digital SLR camera. 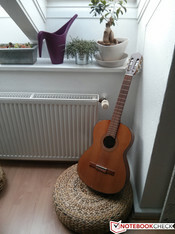 It feels like you are standing in the middle of a room and can see every angle of the object when viewing the 360° panorama in Android's standard gallery. We have gotten used to the fact that manufactures do not always overwhelm us with a large number of accessories. This supposition was again confirmed since the included accessories are very sparse. Beside the smartphone, we only found a modular power supply and a quick start guide in the box. Regrettably, Google does not even include a headset for its bestseller. However, it is also questionable whether the customer can demand that in view of a price of EUR 349 (~$450) for the 16 GB version. 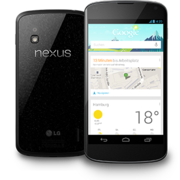 Google touts the Nexus 4 with the option of recharging the device without any charging cords. 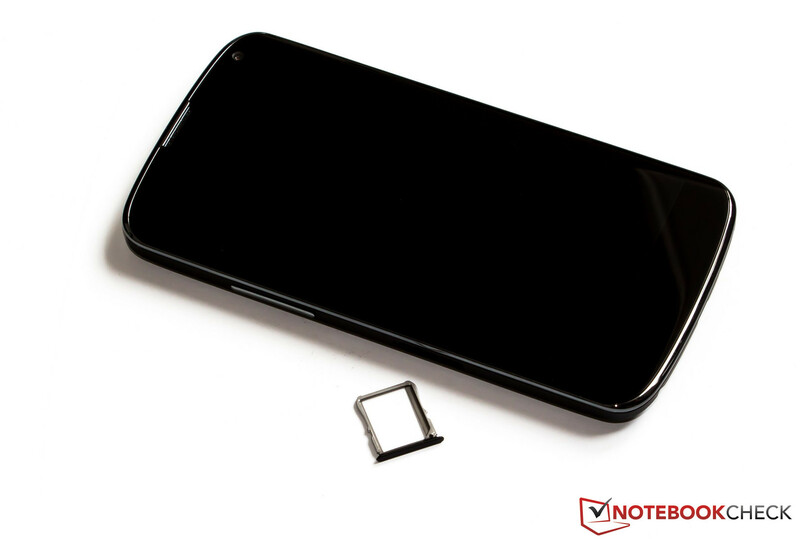 An optional, inductive charging mat on which the Smartphone is placed is required for that. A compatible, third-party charger is available for EUR 49.99 (~$65). LG offers a limited 12 month warranty on behalf of Google on the Goolge Play website. But other retailers (like Saturn) offer 24 months warranty according to their website. 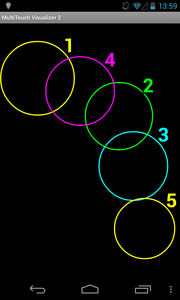 The capacitive touch screen is able to recognize ten-finger input. All touch-inputs are implemented accurately and quickly. The device also copes with all kinds of touch gestures. The default Android keyboard is preinstalled. Owing to the large 4.7-inch screen, the touch keys are sufficiently sized to ensure accurate typing. The keyboard often covers small screens by about 50% in the landscape mode. This is not the case in the Nexus 4. The Galaxy S3 and iPhone 5 still rely on a physical home button. The Nexus range now omits this button and only uses touch control on the screen. 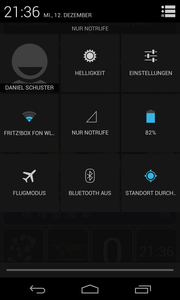 The three touch buttons "back", "home" and "menu" rotate along with the screen by 90° in the landscape mode. This also means that approximately 5 millimeters of the screen are always "lost". We think that the competition's concept, such as that of Samsung's Galaxy range, makes more sense. The main navigation buttons are outside the touchscreen. A resolution of 1280 x 768 pixels in a 4.7 inch screen is pretty good. There are other screens that have higher pixel density but we do not hold it against the device as a drawback (iPhone 5: 326 ppi). The screen in the Nexus 4 impresses with rich color reproduction. 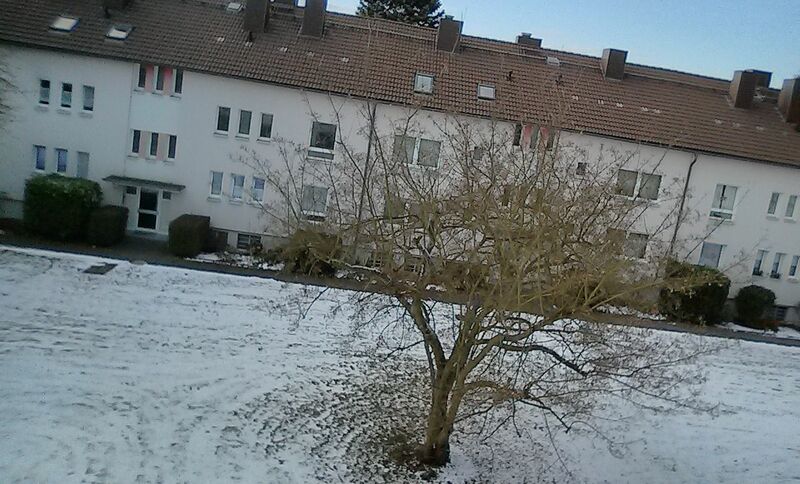 The average brightness of 275.3 cd/m² is not the brightest and should have been better. HTC's 8X (293.8 cd/m²) achieves slightly better rates but it cannot be compared to the brilliant screen in the iPhone 5 (486.8 cd/m²). The illumination of 93% leads to a homogeneous brightness distribution which allows it to hide the fact that the brightness level is not high enough. Differences are not visible to the human eye. 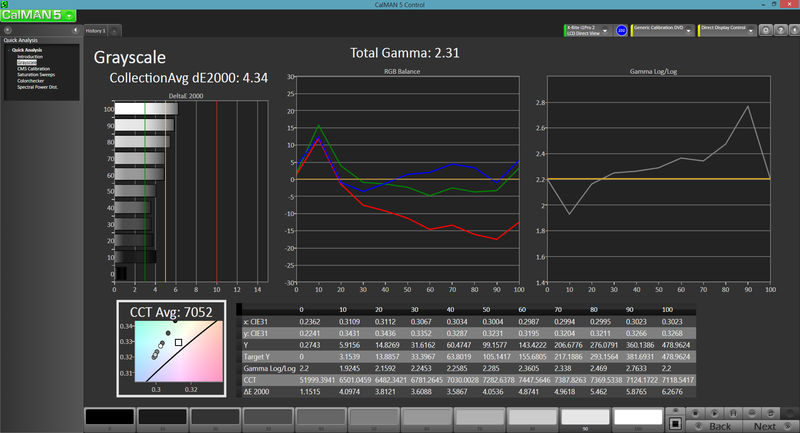 We recorded a black value of 0.24 cd/m² using the Gossen Mavo Monitor. This results in a very high contrast of 1179:1. 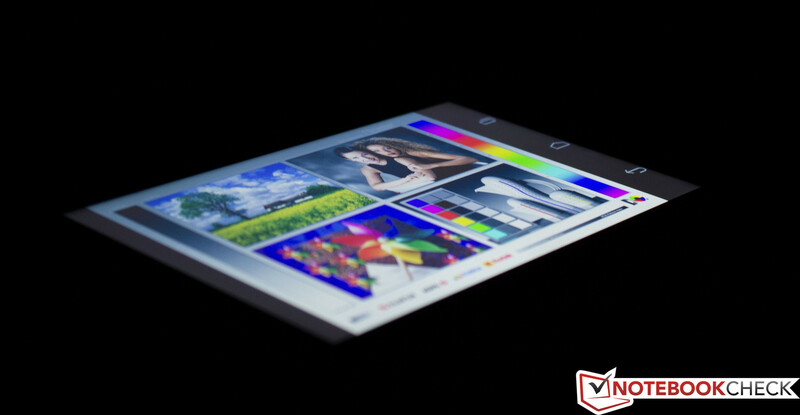 The device would benefit from higher brightness in outdoor use because the screen is very reflective. The high contrast alongside the relatively medium brightness is able to minimize the effect of reflections and enables viewing the content on screen in difficult situations to an extent. This part of our review is consistently getting shorter owing to the In-Plane-Switching technology (IPS). The liquid crystal screen in Google's Nexus 4 is extremely stable when it comes to viewing angles. The contrast and color fidelity are maintained at the widest angles. Our test device exhibited good to very good color accuracy. Red and magenta presented the strongest deviations but remained within the range when measured with a DeltaE 2000 of approximately 5. 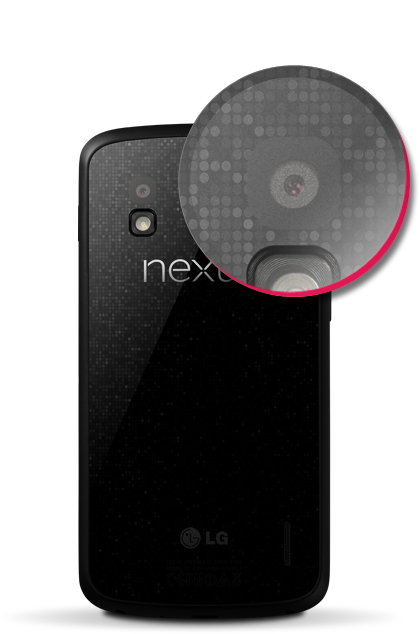 Google's Nexus 4 comes with a range of interesting hardware features. LG and Google have agreed upon the latest high-performance components. The SoC (system on a chip) is a Snapdragon S4 Pro model number APQ8064. It is built using 28nm technology and works in accordance with the ARMv7 instruction set. The quad-core features a clock rate of 1.5 GHz and a 2 MB level 2 cache. One of the most forward-looking features is certainly the generously sized RAM. Competing models rarely feature 2 GB of RAM. The graphics unit is just as well equipped. The Adreno 320 GPU ensures enough power for multimedia applications. The hardware specifications list shows that the device is sufficiently powerful, on paper at least. There are sufficient benchmarks available to test the prowess of the hardware on the Android platform unlike the Windows Phone 8 platform. The Nexus 4 performance was satisfactory when it was put through its paces. In a direct comparison with the iPhone offered up to 5 fps less in GLBenchmark 2.5. The competitors from Samsung and HTC were also defeated in AnTuTu Benchmark v2. The flagships from other manufacturers achieved 30% lower scores on average. Surprisingly, the Asus Padfone 2 achieved considerably better scores in this benchmark and in the Linpack benchmark, although the same SoC is installed. In a smartphone comparison, the Nexus 4 manages its way near the top of the list in the synthetic benchmarks. The score does not look quite as good in the browser-based performance tests. 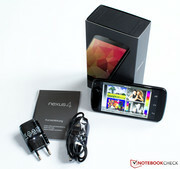 Our test device provided a lower score than Samsung's Galaxy S3, the Asus Padfone 2 or the Apple iPhone 5 in all tests. As usual, the small exception is the Google V8 v7. 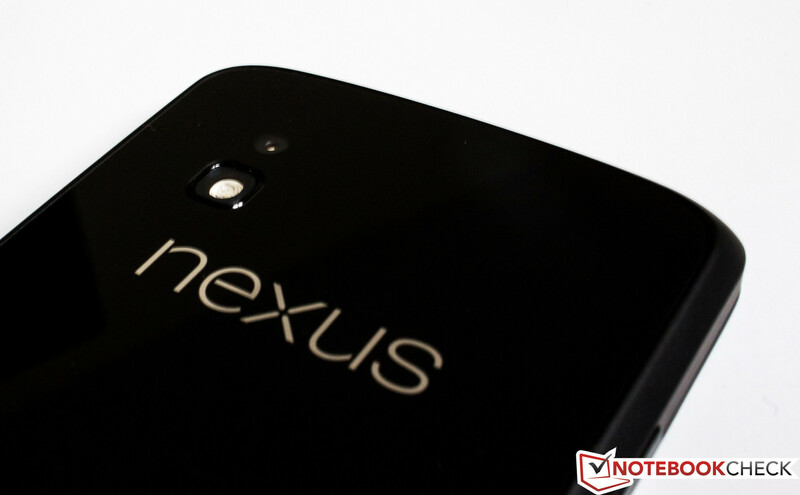 The Nexus 4 achieved a 43% better score than the HTC 8X. But that is unfortunately not enough to reverse the rather low scores. We used AndroBench 3 for the last part the test. It assesses the flash memory's write and read performance. 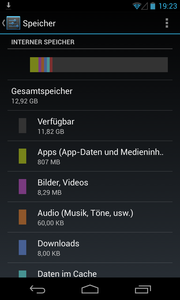 The Nexus 4 almost managed 50 MB/s in sequential read of 256 KB files. Neither the Asus Padfone 2 nor the Galaxy S3 did a better job here. The difference is clearer in sequential write. Portable devices are getting bigger and the screen resolution higher. Thus, using the smartphone as a multimedia player would be the obvious thing to do. However, the higher the resolution the more work the SoC has to do when playing Full HD videos. Many low-performance smartphones do not achieve more than 25 frames per second. We used the trailers from the movies James Bond: Skyfall and Transformers 3: Dark of the Moon in Full HD quality for the test. The hardware has enough capacity to render everything easily. This is similar for the games assortment in the PlayStore. We did not find any 3D games that were a problem for the Nexus 4. 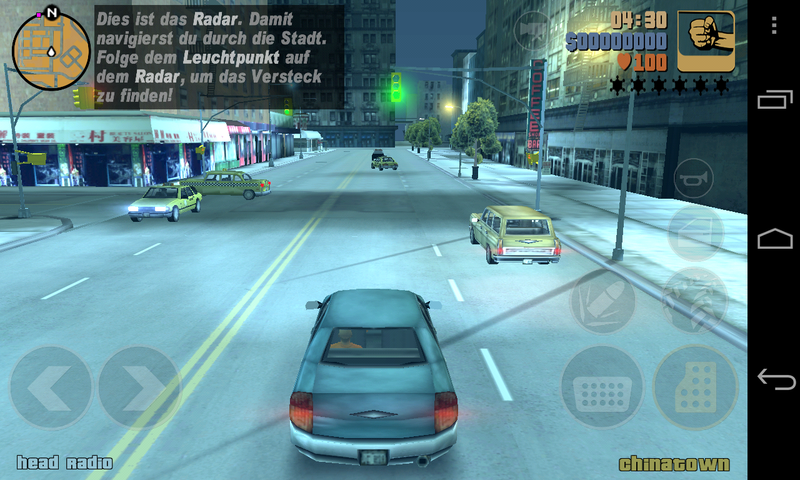 For example, GTA III did not even push the device to the maximum temperatures that we ascertained in the "Temperature" part of this review. 2D games, like the popular Angry Birds, will of course run smoothly. 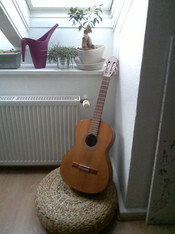 The speech quality is based on several test calls in different surroundings. The called party could hear us well in all situations and perceived our conversations clearly and was intelligible. The maximum volume is high enough to make calls from the passenger seat of a car. We were also satisfied with the performance of the installed hands-free equipment and its sufficient volume. The passively cooled smartphone achieved a maximum temperature of 43.2 degrees Celsius in the upper center area of the screen at full GPU and CPU load. This is a temperature difference of nearly 11 degrees to the lower left area of the device. 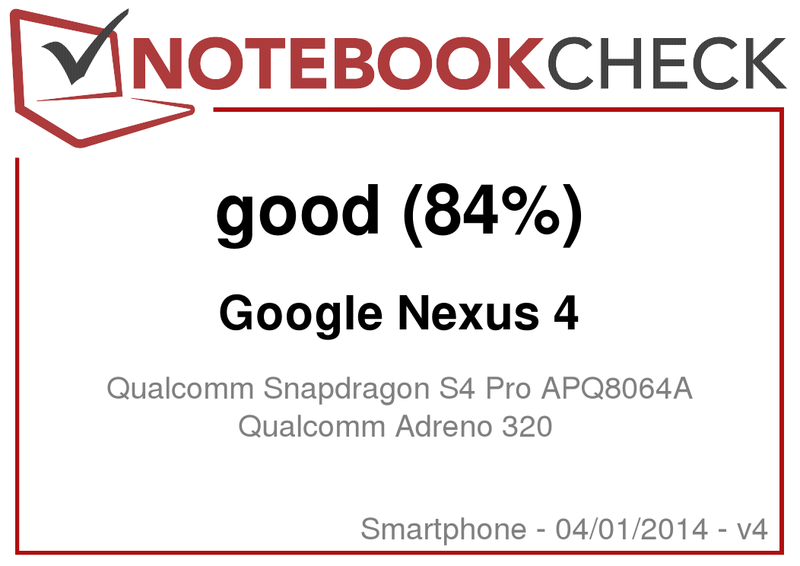 However, we never managed to push the Nexus 4 temperatures to the specified rates because the hardware was never pushed with normal workloads, except in the case of the full load simulation. The smartphone's maximum idle temperature was 37.9 degrees Celsius and remained so when used for occasional Internet browsing, making calls and no compute-intensive tasks are performed. The temperatures never climbed to a level that worried us or made working with the device impossible during the course of our tests. The maximum temperature of the power supply was 37.9 degrees Celsius which is also within an acceptable range. Update: The idle temperatures of the Nexus 4 are very dependent on background tasks. The idle temperatures reach the above levels after the initial Smartphone setup. After that, 27 - 31°C was usually the measured values without load. 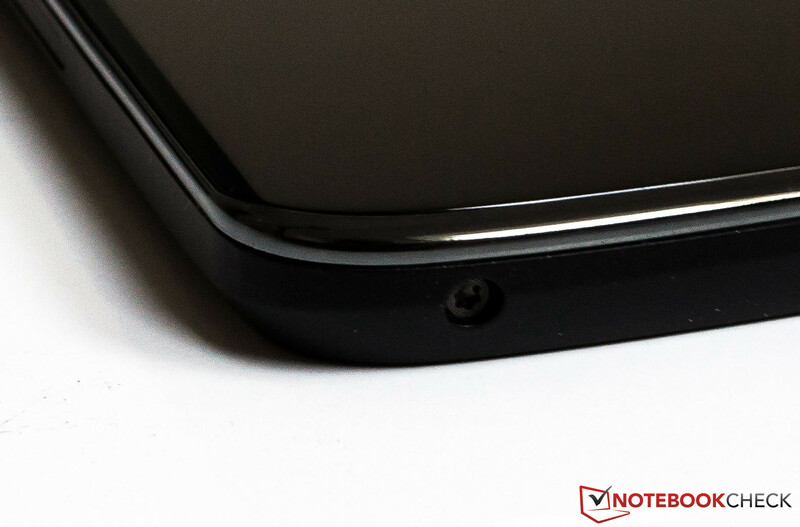 The device's sole speaker for playing music is located on the back. Regrettably, the sound quality was poor. The sound turns very tinny and bland at about 60% of the maximum volume. The speaker virtually neglects lower pitches. The sound becomes unpleasant when the volume is increased to very high levels. 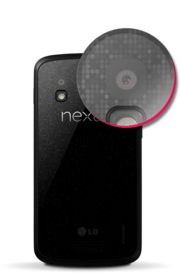 Because the back of the device is sleek and flat, the speaker is completely covered when the Nexus 4 is placed on an even surface. This reduces the maximum volume and the sound becomes distorted. To extend the time between two battery recharges, it is advisable to keep the power consumption low and not use power-guzzling applications. The Nexus 4 is satisfied with 0.7 to 1.4 watts in idle mode. The screen should be manually set to its minimum brightness and the wireless modules should be disabled to achieve a consumption of only 0.7 watts. 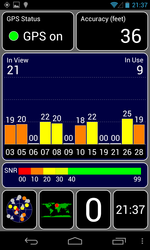 The consumption is twice as high at 1.4 watts when the maximum brightness is used and the Wi-Fi module is turned on. We have to note that the SoC was not fully loaded, so compute-intensive programs were not running in the foreground. The power consumption climbs to 3.9 watts when the quad-core is loaded using the Classic mode of the Android app Stability test. The consumption climbed to a maximum of 6.5 watts when we added simulated GPU load. The Samsung Galaxy S3 consumes a maximum of 3.4 watts and the iPhone is satisfied with only 2.9 watts. The non-removable battery lasted for 2 hours and 36 minutes before it had to be recharged in the maximum load scenario with a consumption of 6.5 watts. Despite its lower power consumption, the iPhone 5 does not last as long (2 hours and 2 minutes). The Reader's test is closer to reality. The brightness was manually set to 150 cd/m², the Wi-Fi module was turned on and a script continuously opened Internet sites. We ascertained a runtime of 7 hours and 20 minutes in this scenario. 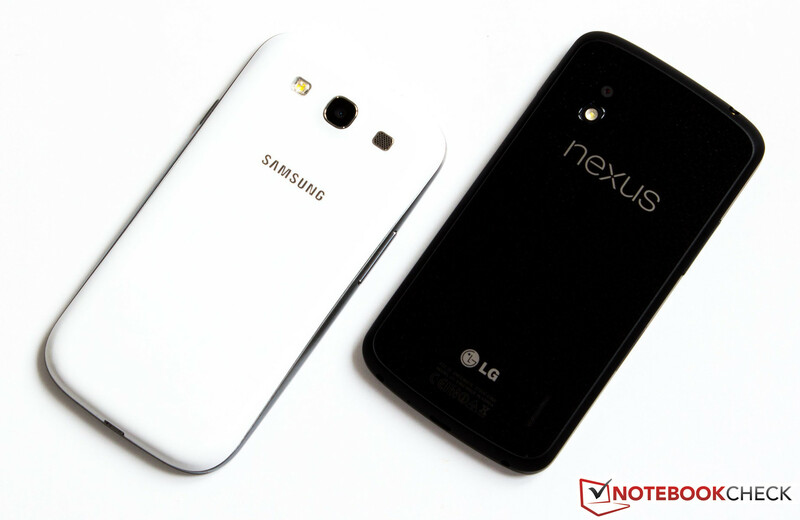 The Nexus 4 was easily beaten by other devices. Although the Galaxy S3 also sports a 2100 mAh lithium ion battery, it lasts an hour longer without the charging cord. Both smartphones however are beaten by the endurance behemoth, the iPhone 5. It sets the standard extremely high with almost 16 hours runtime in the Reader's test. Google is yet to officially introduce a product after its acquisition of Motorola. But it has done an excellent job when leveraging the manufacturing abilities of other companies. 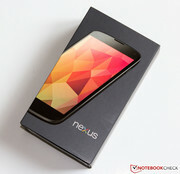 Both the Google Nexus 10 and Nexus 7 delivered decent performances for the price at which they were offered. 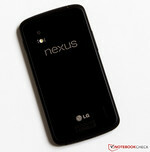 The build of the Nexus 4 is compelling and we like the design despite its plain black color. 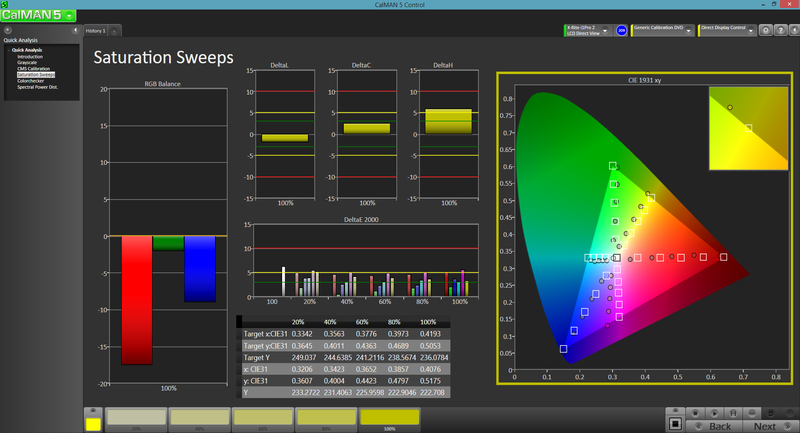 The WXGA (1280 x 768 pixels) IPS screen's average brightness of 275.3 cd/m² is much lower than the iPhone 5's Retina screen. It is enough to easily display content outdoors. All common wireless modules and interfaces are available apart from the omitted microSD slot. The battery also can be recharged via an optionally available induction charger. The eager multimedia user does not have to worry about any performance hiccups. Neither playing Full HD videos nor sophisticated 3D games push the SoC and its 2 GB of RAM to the limits. The primary camera's quality also presented decent results in our tests and the innovative "Photo Sphere" software feature earns a bonus point. The battery runtime is noticeably lower than its rivals. Both the Galaxy S3 and iPhone 5 do a better job. We can only hope that the battery runtime will be increased via Google's excellent software update policy. 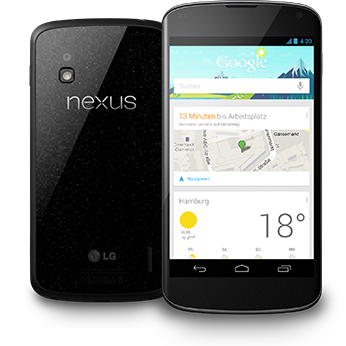 The Google Nexus 4 (made by LG) is a promising device. The premium smartphone misses the "Very Good" rating by a whisker. Problems with reconnecting to an existing Wi-Fi network are annoying and will hopefully be eliminated by a software update. We not only find the hardware but also the price compelling. Such a high-end smartphone fused with guaranteed updates to the latest Android version for 299 Euros (8 GB version) or 349 Euros (16 GB version) will certainly be a challenge for the competition to match. and an 8 MP primary camera. The front-facing camera has a resolution of 1.3 MP. that of the Galaxy S3. Reflections are an issue user. the back and both are made of glass. the keyboard's use is comfortable. It's even more comfortable in the landscape mode. both Torx screws - only for pros! on the left side of the device. Items in the delivery package. Detailed view of the modular charger. The SoC is powerful and works well with the generously sized RAM. No performance bottlenecks could be found. Better battery runtime to compensate for the drawback of the non-removable lithium ion battery wouldn't hurt. A microSD slot would also fit perfectly. The price-performance ratio is good. Almost all manufacturers can take an example from this. Outstanding hardware for a reasonable price.